Good evening; as the founder and creator of the group, Confession of Wonderful Women on Facebook, I’ve only disclosed is that I struggle with “mental clarity”. That doesn’t tell you much. I will now make myself extremely vulnerable like you many of you have. This is incredibly difficult for me. As its probably was for many of you. It’s also scary. I put off a somewhat Perfect perception I’ve been told. This is far from the truth. I was molested at age 11. It didn’t go on for very long but enough to leave permanent scars. I started becoming promiscuous in my latter teen years. I had 2 unplanned pregnancies at age 21 and 23. Best thing possible as it settle me down but only a little. I had ZERO interest in being a mom. A host of problems followed. I had an affair with a married man his name was Craig. He left his wife, I left the kids dad. We were together 6 years, married for two. He committed suicide Aug of 2007. Worst day of my life thus far. My husband now, Gary and I, actually dated when Craig decided to go make it work with his then wife. As soon as he decided he missed me to much and left again I was gone. He was my addiction. Literally. I miss the fun times. I do not miss the alcoholic, mental abuse. I developed an eating disorder because I was never good enough. I reconnected with Gary when I was separated from Craig. I had no intention of getting divorced as I was so in love I believed he’d get better. He didn’t. I remarried 10 months after he passed away. I think it was God’s way of keeping me from self destruction. I have sabotaged this marriage in every way. Convinced Gary would leave me just like Craig did. Maybe not in the same way; but convinced he would. In my hindsight I can’t understand why he’s stayed. I’ve been down right nasty, venomous with my tongue. Lashing out at him and taking out on him all the hurt Craig left behind. It hasn’t been easy for him to stay; but he continues to say that he sees my potential. It baffles me. In 2008 I was dismissed with bipolar II, borderline personality disorder, depression, PTSD, and onset of bipolar depression. I told Gary we could call off the wedding; it was 6 weeks away but he refused. I’m not sure why. I denied the acceptance of these diagnoses and used marijuana to ease my troubled mind. It worked, but I quit using it for its purpose and started using it recreationally. I found that’s while it calmed my angry storms I no longer used it to calm me. I WANTED to sit in my anger. I didn’t want to be snapped out of it. I was JUSTIFIED in how I felt. Because of this I started lashing out not only at Gary but now my kids. That had NEVER happened before. My kids had become my entire world after Craig died. I decided to get real help. I quit using marijuana Jan 28th, 2015. I switched psychiatrists; she that took an entire hour to listen to me. She validated me and empathized with me. I NEEDED this to want to get better. I developed a trust in her that I didn’t have with my previous psychiatrist. She put me on medication. We’ve had to tweak it. I’ve still had meltdowns BUT they’re less frequent. My venomous tongue is controlled 99% of the time. I’m still edgy at times. However instead of taking it out on people I engulf myself into my clients (I’m a nail tech). My clients keep me sane. I don’t know where I’d be without them. Many say they don’t know what they’d do without me. That’s so weird for me to hear. I don’t fell worthy of that statement. This is a fraction of me. It’s why I started this group. I wanted a place to be me. 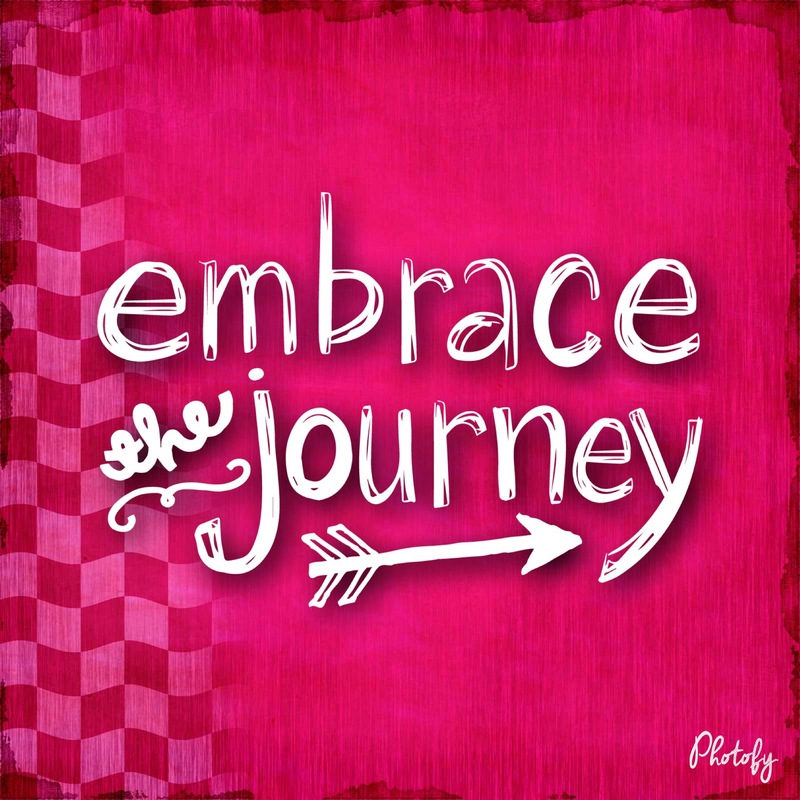 To share this journey with others who struggle. Thank you for being here; not just for me but for each other. You ladies are incredible. Each of you bring something wonderful and unique to this group. Heres the deal….tonight I feel helpless. After already telling my husband I was HANGRY literally the moment I walked in the door…..he proceeds to tell me about a conversation that I had with him yesterday that made him feel bad. It was not my intention to make him feel bad, it wasn’t my intention to make him miss his mom more. If anything I would’ve thought he would’ve gotten out of the conversation that I indeed understand that the woman in most families are generally the “rock” do to speak. He said I was repeating things he already knew. I, on the other hand was merely describing how overwhelmed I feel by all the hats that I am required to wear to keep this family together. To top it off not only do I have to keep the family together and actually TRY, like PHYSICALLY AND MENTALLY TRY. I have depression, I have BPD, and I get the pleasure of dealing with its sister with bipolar II. And that in and of itself is not a pity party it is fact. I take two doses of medication that are supposed to help and tonight they do not feel like they’re helping at all. I seriously feel like I could pull my hair out. And truly I haven’t even had that bad of a day, it’s just that when you deal with mental illness everything is heightened by a million. I have gotten him article after article to read about this. He should know by now that when I say I’m PMSing that is never a good time to bring up something that’s upset him. I have no idea how this is escalated out-of-control, but I do know for certain his feelings are not my fault. I’m so sick of everything turning into a damn pity party. It’s extremely clear that I don’t feel good, mentally, I was extremely hungry, I had this stupid thing I have to watch online for my kids for the school, I’m stressed out about 1 million different things but all he can think about is himself. Meet Florence….She has a slight partying problem. Everyday I come out to see this….I stand her back up; but every night she keeps falling over. I’ve decided that the problem is real. She’s got a drinking problem. I’ve threatened to put her in Roosters anonymous, because I LOVE Florence! A tin rooster intervention! Why does she keep falling over!? Doesn’t she love me too!!??? Ugh. 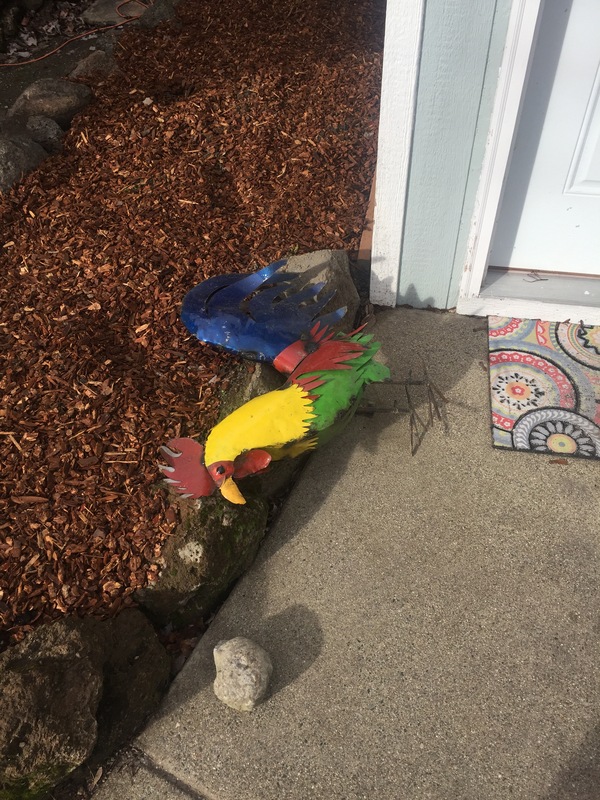 The failing relationship between a human and her rooster…..
I’m sorry to say Bridget…..your Fired…. I Woke up to a really weird message on fb. Took care of it.I was fired by a client in a strange series of weird and unfortunate events. I’ve been fired and I’ve fired clients. The difference? I’ve talked with my clients before shafting them. It generally works itself out. Others, on the other hand, would prefer just to bottle things up, leave and make it look like we’re all winning. Everything is how it should be. I’m learning very quickly that people come in and out of our lives. I’m learning that people’s opinions just can’t matter to me or it’ll just drive me bonkers. I’ll never be good enough for everyone. My work won’t always please everyone. Where one person leaves it allows another to walk in that I may have not ever met otherwise. I’m thankful for the things I learn from each person that comes through my doors. When ladies choose to leave or find someone else it’s not always a direct reflection of me. I have to remember this especially if nothing was said to me prior. On the plus side I did get up and exercise with the encouragement of my friend. I also went to coffee with a longtime friend. Depression comes in many forms. After coffee, I picked up my daughter, we watched Keeping up with the Kardashians. Then, I slept most of the afternoon. I’m hoping my doctor can help me this week. I’m a realist. Everything is what it is. We have the power to changer certain aspects of our lives. We can exercise more, eat less junk, read more books etc….you get the point. What can we not change? Our mental health. We can do things to HELP; like see a psychiatrist, counseling, take medication, meditate, or pray. I personally struggle with social anxiety. I’m super social. I love people. I love random conversations. I love when my fitness instructor pushes me in class. These are empowering. The most empowering tool I have to reduce anxiety is to write. I take anxiety meds, medication to control my ever changing moods. But at the end of the day, blogging/writing is the therapy that gets me through. 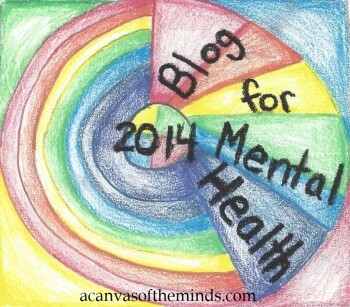 I started this blog so I wouldn’t feel alone. I know I’m not alone. It’s scary putting yourself out there for all the world to see. To be vulnerable to criticism. People might think “wow! She’s brave” and if you think that then thank you. But at then end of the day I don’t necessarily see myself as brave. I see myself as a broken individual who is happy to have friends who Accept me for who I am. People I can rely on to be my cheerleaders. I encourage you to find your own cheerleaders. Even if it’s just one or two people. Which is really all we need. We have different people for different areas of our lives. I have my cheerleaders at the gym, my cheerleaders in my personal struggles, my cheerleaders for my mental health….etc. I surround myself with all of these people because it’s what I personally need. What I need may be drastically different than what you need. It’s not wrong it’s just different. I also encourage you to be your own cheerleader! Disclaimer: I deal with uncomfortable topics about myself with humor. I don’t know if anyone will find the humor in this…but here it goes…. (Let me wipe my tears of laughter). Quick side note; I just sneezed/laughed and half my anti-anxiety meds just came out. I think it’s justifiable to grab another. I need a good nights sleep which is where this post is going eventually…..
Ok, soooo, I’ve been taking these meds at night because their supposed to make you tired. However; I’ve been having the most VIVID weirdest dreams. I have a friend Jaimie who does nails and I dreamt that she could do an entire sea sculpture on someone’s nails! (She’s fantastic, but wow!) If she could do what I dreamt she’d be a millionaire. Or….people would have sea horses on their nails. Either way it’s a win/win. Because really, who WOULDN’T want a cute little sea horse on their nails! Maybe I should call her…. Ok, I’m getting off track. And for the record, until I started this new dose of medication, I NEVER dreamt. I see as a common theme in the dreams lately is that just before I wake up in the morning my dream usually pertains to my situation currently. Many of you know my children so I’ll protect their privacy…(that won’t last long). One day when I have a book published I promise they’ll get a cut. Actually they probably won’t, because if my son gets into a musical theatre school, and my daughter becomes a veterinarian, this book MIGHT pay for that! Except this isn’t a book. But if you want to pay to read this I can send you my address as to where you can mail a check. It’s for a good cause….children’s education! ANYWAY….I have these dreams and their so vivid, some are disturbing and some I wake up going “huh”???? I’m still thinking I need to call Jaimie to see if she knows about this ocean sculpture nail stuff….maybe I have telepathy!? Side note: did you know your in REM sleep when your dreaming? I wouldn’t think so because if I can REMEMBER my dreams on a nightly basis, I’m thinking I’m not getting much quality sleep. I’ll let you know what I find out. Oh, and I changed Siri to the make British dude today because that’s what it was in one of my dreams….that’s right folks! Following my dreams!! !